At this year’s IBA show, MECATHERM, a world leader in automated production lines for industrial bakeries, presents three major innovations to the market, including M-TA, a unique oven lauded for its flexibility, precision and efficiency. Over the past 5 years, the market has registered a 60% worldwide increase in bakery and snacking products (source Mintel), a symptomatic number proving the context’s evolution, clearly migrating from a mass marker to a niche market. With the evolution of both consumers’ taste and competitive pressure, today’s industrialists need equipment which can fulfil their expectations regarding industrial performance but also the demand for product diversity. During the last 50 years, MECATHERM has been recognized for its savoir-faire in the crusty bread production domain but also for its industrial ovens’ performances. With this new oven’s launch, MECATHERM shows yet again, its expertise. Developed to bring flexibility, precision and efficiency to industrialists, it will permit them to adapt their production to the demand, today as well as tomorrow. 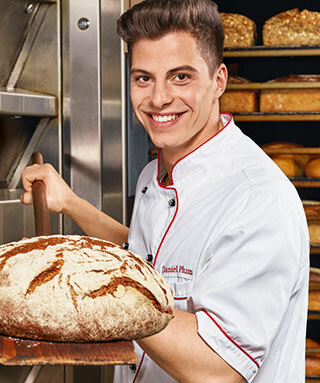 The new oven, facilitates a diverse range of bakery products and is ideal for all breads, sweet goods, and snacking products’ baking requirements. In order to bring maximum flexibility, the line developer’s R&D teams invented a completely modular oven. It is equipped with compact heating modules reaching 25m² at maximum and operating in full independence. MECATHERM has also developed a patented unique mobilar system. This innovation allows the user to double the energy transfer modes available on the top and on the bottom of the baking chamber: convection (air streams) and/or radiation. No less than 6 different baking modes are available on each zone of the oven. heat transfer modes allow bakers to establish their own tailor-made baking curve, for unique and differentiating products. The oven also offers efficiency with a fast change-over time. The R&D teams have worked on the oven’s reactivity in order for its temperature to adapt very rapidly and precisely when change-overs happen. The use of a specially created highly modulating burner, as well as the rate of air renewal being extremely high, allow rapid raises and drops in temperature. Depending on the customer’s need, this solution allows to bake products on any kind of supports or directly on hearth. The oven’s huge flexibility means it can bake an entire range of products using just one equipment, without compromise on quality, allowing rapid evolution of the product range depending on market expectations. One of the major strengths of the new oven is its baking precision. Indeed, it profits from a new concept of the aeraulic part, on the base of a simulation model for the computer assistance flow simulation, specially developed by the R&D teams. This permitted to define and redimension the air flow circuits to obtain an extremely homogenous flow on the oven’s width. The ultra-reactivity of the heating modules given on the one part, by a powerful turbine which continuously renews the baking chamber’s air, and on the second part by a modulating burner capable of adapting its operating regime instantly, cleverly prevents the oven from an overheating effect (called "flash heat"). This also means the oven can instantly adapt to the product load to ensure perfect baking, even in case of partial loading. The oven also benefits from a rejected stack measuring device, in order to pilot its opening and closing. This instrumentation permits a precise management of the oven, especially the humidity, which is particularly useful for baking crusty products. The precision of this new oven, ensures high quality, uniform products, even with delicate products while ensuring a no loss production. There are also many advantages in terms of cost control, particularly in relation to production and exploitation. reactivity, and controlling program’s intelligence, the time of rise and drop in temperature are very fast: only 20 minutes to gain 100°C and 30 minutes to lose 100°C! All means are deployed to make the oven monitoring is made as easy as possible for the user. For example, the control for the right balance of blowing flows and suction flows, inside of the baking chamber, is totally integrated and automatically managed. On the other hand, a brand new, continuous rejected stack measuring device was developed, in order to easily and efficiently manage the balance between entering and exiting flows in the oven. A very intuitive Human to Machine interface was developed to manage the oven. The baker now has the possibility to follow the baking process via a real image of each baking zone. Depending on the user’s profile, identified by a badge system, the settings possibilities and access rights are more, or less accessible. The new oven also permits better energy efficiency. The oven’s entry and exit zones confinement, completely integrated to the structure, reduces energy loss. The controlling finesse, and reduced time of change-over also contribute to reduce energy consumption. The diminution of the time needed for maintenance interventions is an added leverage in the cost of exploitation optimization. In order to respond, MECATHERM created a smart equipment permitting a better accessibility to all elements of the oven. The outside claddings of the oven are dismountable without tools. Easy access to technical elements have also been addressed in order to simplify and shorten any maintenance interventions. The maintenance operations’ safety is reinforced by the installation of a railing at the top of the oven.